Children and young adults are frequently taught the value of obeying authority—behaving appropriately by keeping in line with the law. But sometimes the laws are wrong and the authorities who create them are corrupt. When is it okay to break the law and to take a stand against injustice or wrongdoing when you see it happen? These are the questions Laura Scandiffio answers in People Who Said No. 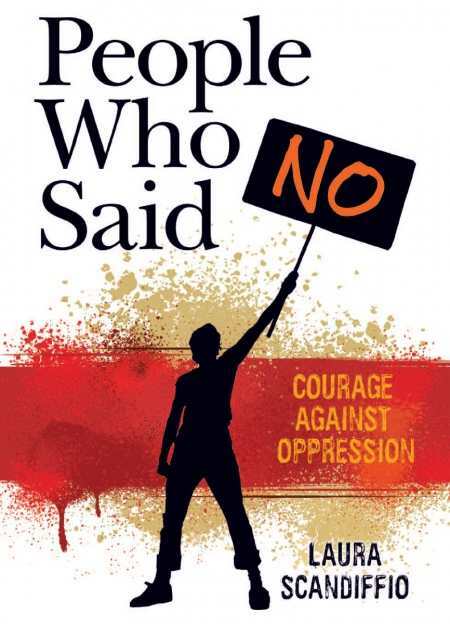 Dedicating each chapter to an individual who stood courageously against a corrupt government, she introduces teenage readers to tenacious people who refused to stay silent, and whose vocal opposition to injustice helped to create massive change. All the examples are derived from recent years in history, including the Holocaust, the Cold War, Apartheid South Africa, and racial segregation in the US. The stories cross the globe, moving from Russia to Egypt and Burma to Germany, and illustrating that injustice has hurt the lives of masses of people all over the world, but that it takes only a handful to make a difference and plant the seeds of change. For each individual profiled, Scandiffio eloquently describes their backgrounds, their conflicts, the courage they had to muster to take a stand, and the kind of retribution they faced. In this way she gives readers a solid understanding of who these people really were and how their courageous opposition affected their lives. Of Rosa Parks, who successfully challenged segregation laws in the US, we are told: “She’d never been a fighter on the front lines, she’d always worked quietly behind the scenes.” Likewise, when Helen Suzman first decided to run as a member of Parliament in Apartheid South Africa, her thoughts were these: “I’ll never win, so there’s no harm in trying.” Was she ever wrong! While each story is based closely on real events, Scandiffio writes in her introduction, she did adapt some conversations or scenes to dramatize her subjects’ struggles. Her stories bring to life ordinary people who made brave choices under extraordinary circumstances, and in so doing, helped make the world a better place. This superb book should be on every library shelf and should be mandatory reading for high school students.